Under a special agreement between cigarette companies and American Legion posts across the nation, folks could buy cigarettes for a nickle a pack to have sent to men and women in uniform. Officials were considering a proposal for the federal government to establish a labor camp for Jehovah Witnesses and other conscientious objectors in New Ipswich. They would work helping on farms, haying, harvesting and cutting wood. Five students graduated from Lyndeborough schools — Pauline Bullard, Bruce Center, Evelyn Howe, Irving Hull, and Marilyn Rudis. Milford delegates to the Star Island Liberal Religious Youth Conference at the Isles of Shoals were Vicki Carter, Ken Hoadley, Bruce Ulricson, and Jill Hawkins. Robert Sterling of Milford was offering a reward for information leading to the recovery of a stolen bicycle, a boy’s 26-inch English J.C. Higgins, red. Robb Wetherbee of Milford was to be the principal entertainer at a summer festival of music at the Milford Unitarian Church, singing hit songs from Broadway musicals and some of his own ballads. Students from Wilton Elementary School planted a rock maple tree in Whiting Park to honor the memory of their former music teacher, Miss Ethelyn Edwards. Milford Area Senior High School’s Tracy Poirier won her third straight New Hampshire singles tennis title. With a projected fall enrollment of 176 students in first grade and 56 slated for readiness classes, Milford Elementary School Principal Mary Ann Pank told the school board that she needed another teacher. 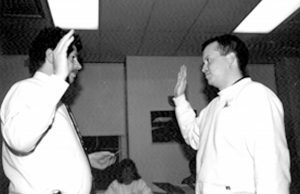 William T. (Bill) Dod was hired as assistant principal at Milford Area Senior High School. Fire officials were probing a blaze that gutted several stores in the Route 101A Amherst Plaza in Amherst. Among the shops destroyed was Designer Consigner, owned by Margaret Woods. Linda Pelchat left her post as Milford Elementary School secretary after 26 years. The Milford Farmers’ Market celebrated its 30th anniversary. It had been founded by Tom Mitchell and Tim O’Connell, both then teaching high school.